This exceptional collection revisits the aftermath of the 1954 coup that ousted the democratically elected Guatemalan president Jacobo Arbenz. Contributors frame the impact of 1954 not only in terms of the liberal reforms and coffee revolutions of the nineteenth century, but also in terms of post-1954 U.S. foreign policy and the genocide of the 1970s and 1980s. 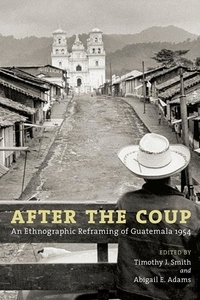 This volume is of particular interest in the current era of the United States' re-emerging foreign policy based on preemptive strikes and a presumed clash of civilizations.Recent research and the release of newly declassified U.S. government documents underscore the importance of reading Guatemala's current history through the lens of 1954. Scholars and researchers who have worked in Guatemala from the 1940s to the present articulate how the coup fits into ethnographic representations of Guatemala. Highlighting the voices of individuals with whom they have lived and worked, the contributors also offer an unmatched understanding of how the events preceding and following the coup played out on the ground.Contributors are Abigail E. Adams, Richard N. Adams, David Carey Jr., Christa Little-Siebold, Judith M. Maxwell, Victor D. Montejo, June C. Nash, and Timothy J. Smith."